Security Council meeting on threats to international peace and security. The United Nations Security-Council on Tuesday called on all countries as well as international organizations to do more to stop terrorists enriching themselves through cross-border organized crime. 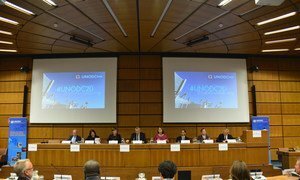 The Council also called on all Member States to use “all existing tools,” and the resources of the UN Office on Drugs and Crime (UNODC), the International Civil Aviation Organization (ICAO), INTERPOL and the World Customs Organization (WCO), to strengthen international cooperation. But in adopting new counter terrorism measures, the Security Council reminded countries that they “must comply” with all their obligations under international law, including human rights law, refugee law and humanitarian law. “Respect for human rights, fundamental freedoms and the rule of law are complementary and mutually reinforcing with effective counter-terrorism measures and are an essential part of a successful counter-terrorism effort,” stressed the 15-member Council. Also in the statement, the Security Council called for better understanding of the links between terrorists and criminal groups which operate across borders, urging UNODC and the Counterterrorism Committee Executive Directorate (CTED) – which was formed to coordinate the UN’s overall effort - to monitor ties closely.